ON Thursday night, I told our boys we were taking them to the park the next day. 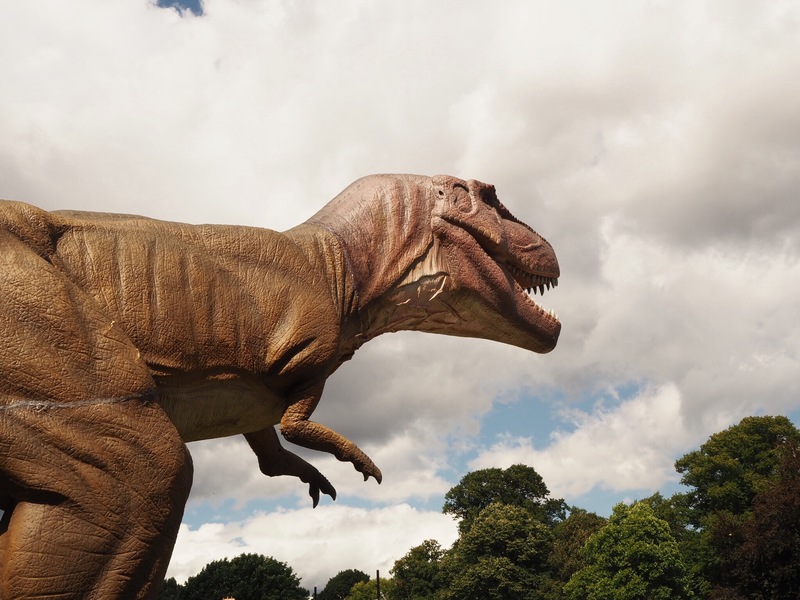 It was a new park that we’d never been to before – Bute Park, in Cardiff.I asked what they thought we might see there, and was give the answer “foxes, or owls”, and a look of ridicule when I asked if they thought we’d see a Tyrannosaurus rex or a diplodocus. 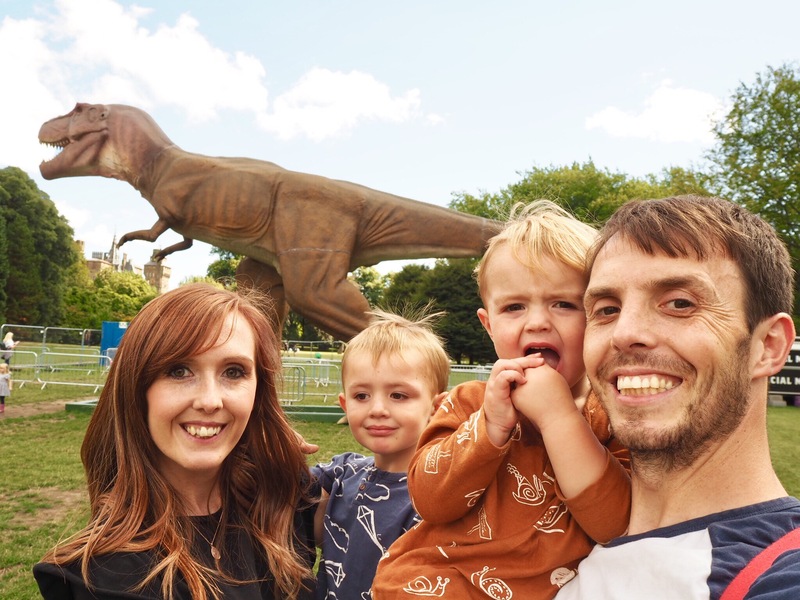 We’d actually been offered review tickets for Jurassic Kingdom at Bute Park in Cardiff*, and I was over the moon. It looked fab, and I was pretty sure the boys would love it. Basically, huge animatronic dinosaurs have been set up in the park as part of Jurassic Kingdom for the next few weeks. I was imagining Jurassic Park, only without the threat of death (always a bonus). Yep, there they were, dozens of dinosaurs the other side of the fence. 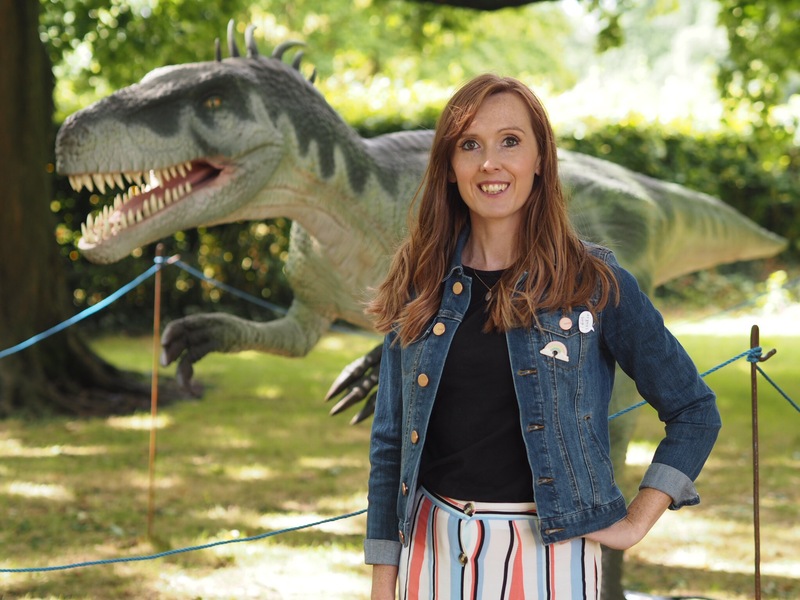 I’m not entirely sure why the fences were normal security style ones that you can see through, because it means a lot of people will have seen the dinosaurs without buying tickets – good for them, but not so good for the Jurassic Kingdom organisers! 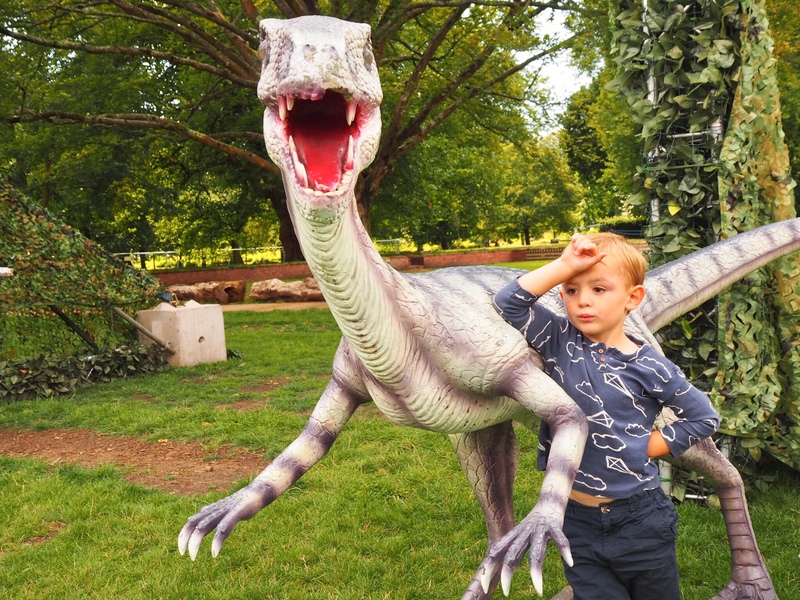 We made our way into the dinosaur enclosure, and realised that actually the experience wasn’t completely set up yet. We’d been invited on the press day, and the workmen were still putting a lot of the displays together, which means we didn’t get to see everything as we should have. It was disappointing that some of the dinosaurs weren’t yet moving, but what we did see was very impressive. As we entered, there was a tyrannosaurus rex just to the right, and two smaller dinosaurs at the gate. 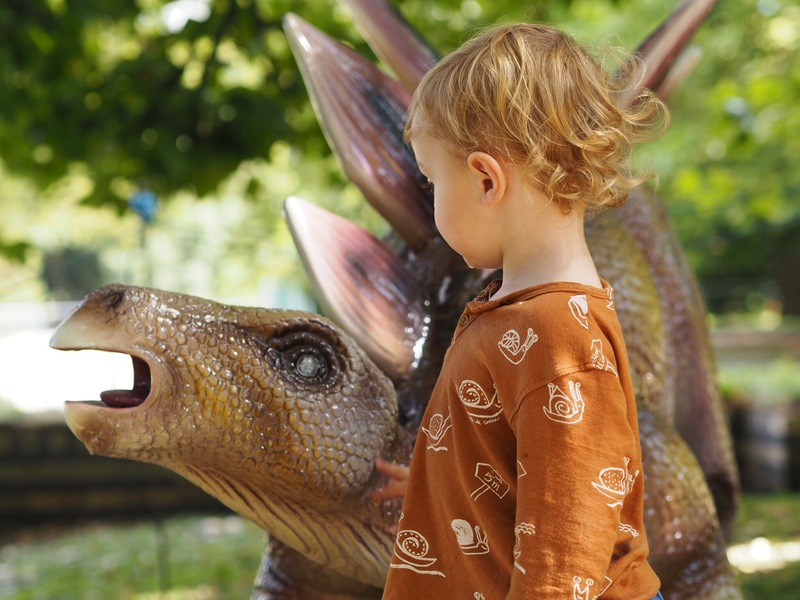 We walked around and came across a stegosaurus, which roared when we heated him, and started to move. Our littlest boy had a bit of a fright initially, but laughed the second time he was growled at. By the third dinosaur, he was confident enough to walk up to them and touch them. Each dinosaur has a display panel with their name and some information about where they would have lived, what they ate etc, so you can take your time wandering around and reading about them. Some of the signs hadn’t been set up yet when we were there, which was a shame as I wasn’t able to answer a lot of the boys’ questions … I’m no Ross Geller, and didn’t think my made up answers would do! 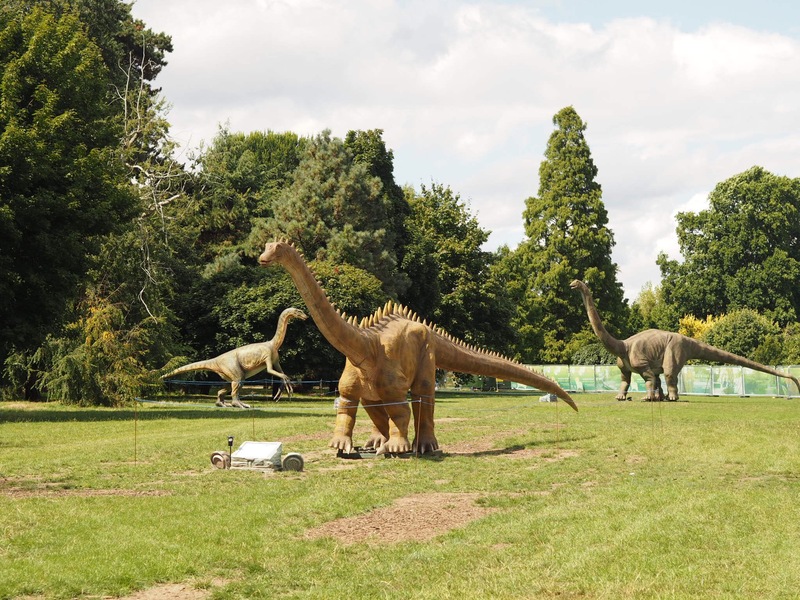 We walked past two dinosaurs trying to escape from their cages, a huge diplodocus whose neck was so long that his head was above the trees, and three dinosaurs fighting each other (complete with bloody war wounds). 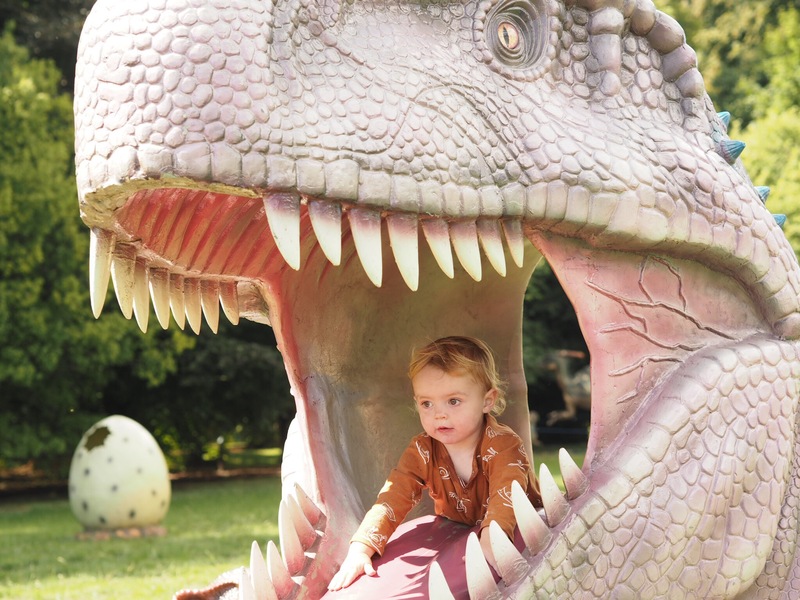 There was a little area in the woods with dinosaur eggs – some hatched, some cracked, and one that children can climb into for photos. On the last stretch, there are a series of dinosaurs which look as if they’re walking along the grass toward the castle. When they’re fully set up and moving that will probably look fab! We found an area with bits of dinosaurs that were yet to be put in place, and of course this is the bit we spent the most time in (eye roll). 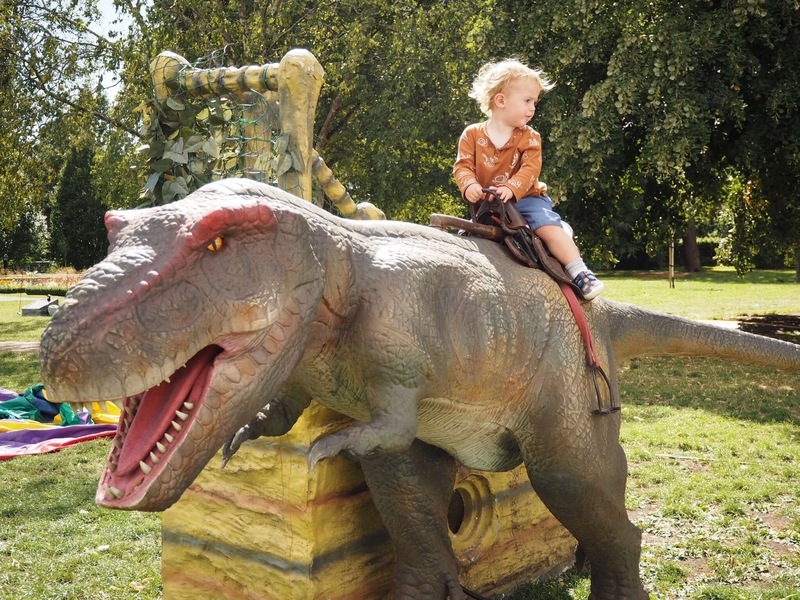 The boys climbed in and out of a dinosaur’s mouth, looked at the babies popping out of eggs, and hopped onto a ride-on dinosaur (less hop-on, and more rip my skirt in the difficult process for me, but the less said about that, the better!). By the time we got back to the entrance, the boys were ready to leave. There were food stalls being set up, along with a bouncy castle and an education tent. The education tent is billed as a big part of the experience online, so it’s a shame we’re not able to say what happens in there as it wasn’t finished yet. 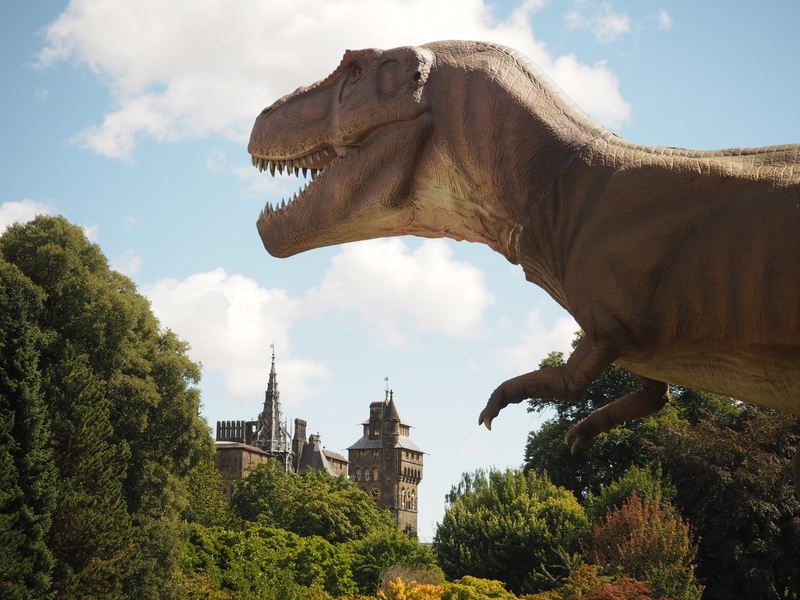 Overall, my thoughts on Jurassic Kingdom at Bute Park, Cardiff, are mixed. On the one hand, I’m disappointed we didn’t get to experience it properly, and the boys weren’t as impressed as I’d expected, simply because most of the dinosaurs weren’t moving. But on the other hand, I can see that it would be amazing to go once it’s fully set up. 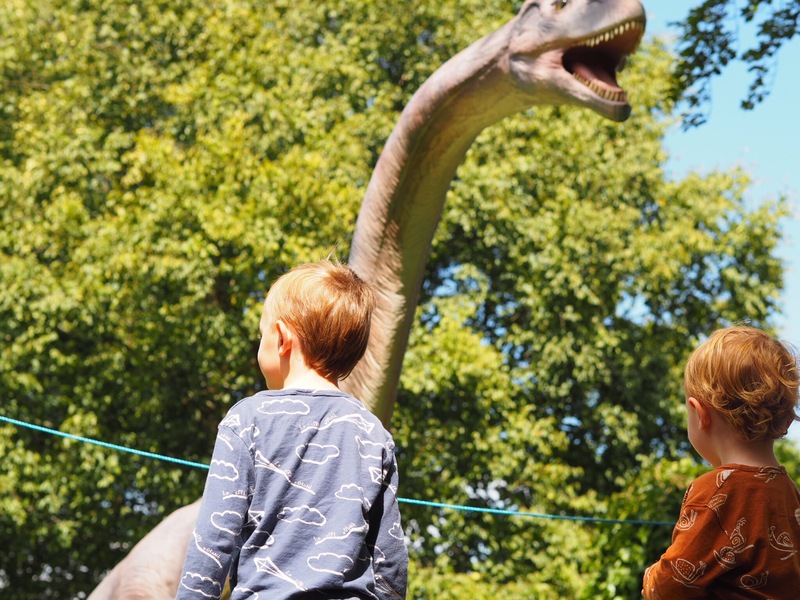 It looks as if there are lights in the ground, which would be really atmospheric in the evening, and there were velociraptors being hung up in the trees, which would really add to the all-round experience. If we’d been able to visit a few days later, I’m sure I’d be raving about it!